Presidio...and all that Brass...a Broadway centric evening! Under the direction of nationally known conductor, composer and organist Dr. David Cherwien, the 64- member National Lutheran Choir’s artistry is rooted in its mission to strengthen, renew and preserve the heritage of sacred choral music. And it does so through the highest standards of performance and literature. 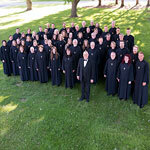 In addition to concertizing and premiering new choral works, the National Lutheran Choir enjoys frequent broadcasts on public radio, and maintains a YouTube channel with selected performances and concert streams. They also have a discography of 30 recordings. Through our reciprocity agreements with the following associations, members may also attend these concerts if seats are available.